A station with big ambitions! This station highest goal was to get their own transmitter, when they finally got one, the operator was not allowed to pick it up, that’s what the rumours says. The station was formed during Christmas 1992, and the first programme was carried by Radio Fusion International in May 1993. 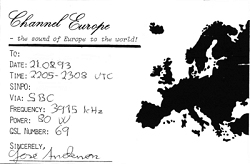 Next programme was via the Scandinavian Broadcasting Corporation, and on the 12th of September, the perhaps most well-known programme so far was relayed by Radio Delta, Ruurlo on 6200 kHz. Since the Delta relay there have been just one more programme which was again relayed by the Scandinavian Broadcasting Corporation.